Mary Robinette Kowal stunned readers with her charming first novel Shades of Milk and Honey, a loving tribute to the works of Jane Austen in a world where magic is an everyday occurrence. This magic comes in the form of glamour, which allows talented users to form practically any illusion they can imagine. Shades debuted to great acclaim and left readers eagerly awaiting its sequel. Glamour in Glass continues following the lives of beloved main characters Jane and Vincent, with a much deeper vein of drama and intrigue.In the tumultuous months after Napoleon abdicates his throne, Jane and Vincent go to Belgium for their honeymoon. While there, the deposed emperor escapes his exile in Elba, throwing the continent into turmoil. With no easy way back to England, Jane and Vincent’s concerns turn from enjoying their honeymoon…to escaping it.Left with no outward salvation, Jane must persevere over her trying personal circumstances and use her glamour to rescue her husband from prison . . . and hopefully prevent her newly built marriage from getting stranded on the shoals of another country’s war. Return with us to Kowal’s awesome, Austen-reboot world! NOTE: If you haven’t read Shades of Milk and Honey, there are spoilers ahead! Pushy: Last Week, Heather and I reviewed the first book in this series, Shades of Milk and Honey, where we first encountered Ms. Kowal’s world: a rebooted version of the Regency era where illusion is practiced as an art form in the drawing rooms of London and by proper young ladies in country estates. When I finished reading Shades of Milk and Honey, Glamour in Glass was the very next book I picked up. Slipping back into this world, returning to watch the continuing adventures of Jane and her new husband was a pure pleasure and I adored ever moment I spent with this book. Heather: Even though it took me a bit to warm up to Shades of Milk and Honey, the last half of the book was full of action and excitement. This really made me excited for Glamour in Glass. But I had another book to read in between these two, and once I cracked open this one, I was so glad that Glamour in Glass started off on an exciting note and galloped all the way to the finish. There was no catching your breath in this one! Pushy: This second book in the series definitely amps up the action, both internal and external. On the smaller scale, Jane and Vincent need to find out how they will work together as a married couple. Both of them have such strong personalities, both of them are so loathe to admit any weakness, that it was interesting to see how they would meld together into a cohesive unit. But by the end of this book, it’s clear that they’re relationship is rock solid and going to be the foundation for a wonderful life together. On the larger scale, it was fascinating to watch them live through the events of Napoleon’s escape from Elba and his return to power. The tension of the people of Brussels around this time, both those in favor of the emperor’s return and those definitely opposed, was an interesting prism through which to observe the Vincents’ friends and acquaintances in Brussels. Plus I ADORE historical dramas, so all of this was like icing on the cake for me! Heather: I totally agree, Pushy! I also loved Jane’s struggles with the differences in how ladies behave in London society versus on the continent. While Jane wants to speak more of her mind, she often has to bite her tongue because it’s what she’s been raised to do, and she finds that women’s roles are much different in European society. It’s very clear that Jane’s skill with glamour is very advanced and is increasing quickly, but she is flourishing because she is working with her husband. Their working relationship, while beneficial to both of them, gives Jane an opportunity to not only shine, but to also become an innovator in the glamour arts. While society doesn’t want her to step to the forefront and be in the spotlight since she is a woman, Vincent certainly will not stand by and take the credit for her ideas and inventions. Pushy: While I definitely enjoyed Shades of Milk and Honey, Glamour in Glass was phenomenal! Right from the start the emotional tension is there. I loved watching Jane and Vincent grow as a couple and I loved the history mixed with magic. I could not put this book down! 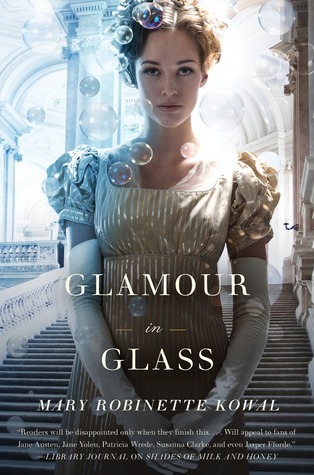 Heather: Glamour in Glass had me hooked from the first page. The newness of their marriage was so realistic, especially with their dealings with the in-laws and how they were still getting to know each other. I raced through this installment and I cannot wait for the third book! Heather: The stakes were high from the beginning, and Mary Robinette Kowal did an excellent job of creating a journey for Jane and Vincent packed with adventure, tension, and emotional turmoil. We both loved this book SO MUCH that we want to put it into your hands as well! SO….it’s contest time! Just enter via the widget below! And if we’d love it if you let us know what about this book most intrigues you in the comments below! One of my favorite things about Glamour in Glass was that Jane’s insecurities about herself didn’t disappear when she married Vincent. She has his love and support but he doesn’t magically (ha!) make all her problems go away. I loved that too, Nancy! But I really liked that Jane was able to push past all of that to get the job done, so to speak (without being all spoilery, LOL). Awesome review, Pushy and Heather! Mimi Valentine recently posted..Cover Reveal and Giveaway: ReAwakened by Ada Adams! I rarely read historicals too, Mimi, but I loved, loved, loved this one! It was so action packed and tension filled that I just devoured it. Isn’t this cover gorgeous? And the cover for book three is even more stunning! It’s up on the author’s blog. I usually don’t pay much attention to covers, but this one is just breathtaking! Thanks for stopping by and entering the giveaway. This combination works out beautifully in this series. You should definitely check it out! I’m drawn to the historical setting for one thing. Europe in the age of Napoleon is a very interesting time and place. The historical setting is really interesting and accurate without distracting from the story. It definitely added to the urgency and excitement in this book. I love historical fiction so the entire premise sounds fantastic!! If you love historical fiction, Vivien, then this one is right up your alley! Hey, Victoria–did you enter your information into the Rafflecopter above? Woo hoo! So glad you guys love this series! I adore it and have been sad it hasn’t gotten as much attention as I feel it deserves on the blogs. So it makes me super excited to your awesome review! You like this series too, Candace? Did you review it somewhere? I’d love to check your review out. Looking at my rating I’m a little surprised that I gave the first one 5 stars and the second one 4. It seems like it should be the other way around. But it’s been awhile so maybe I don’t remember so well. Looks like I missed the review of Shades of Milk and Honey. I’ll have to hunt that one down. I didn’t read the review so I wouldn’t mess up the experience of reading it. LOL, Heather! You’re always eagle-eyed enough to make sure you aren’t spoiled! You all intrigued me with the first review and I love that the second book is just as good (if not better). Sometimes that second novel just doesn’t live up to the first. And the cover is quite pretty–I like the bubbles (yes, easily amused). The first book really took me about half way through to warm up to it, but this one was great right from the start. This was no sophomore slump in my opinion! Loved Shades of Milk and Honey and can’t wait to see what happens to Jane and Vincent in Glamour in Glass! If you loved the first book, Leanne, I’m sure you love Glamour in Glass! I’m super intrigued that its historical fantasy. It sounds like its the best part of both worlds. Thanks for the giveaway. I think that’s why I enjoyed it so much since it was a nice mix of history and fantasy. Thanks for stopping by and entering the giveaway! You drove three hours to meet the author, Greg? Wow–that’s dedication!!! She actually lives locally to Pushy and I, so it would be nice to meet her around here some time. I only WANT to read some Jane Austen just to say I have haha. but then it’s so old and intimidating so I go for the “inspired by” so see what it’s all about. I don’t think I caught the review for the first book I’ll have to check it out it sounds like a great series! I read Jane Austen so long ago, Giselle, that I think I’ve blocked out that high school experience!! Generally, I’m not a big Jane Austen fan. I periodically watch one of the various movie adaptations with my wife (because she loves those), but I usually shy away from the books. But I was intrigued by the pitch of Shades of Milk and Honey being “Jane Austen + magic”, so I gave it a try. Mary Robinette Kowal did a great job making use of the different character archetypes that are so common in Jane Austen’s books. I expected things to get boring once you figured out who was the ‘Mr. Darcy’ character and who was the ‘Mr. Wickham’ character, but Mary very successfully kept things quite interesting. So, I finished Shades of Milk and Honey rather quickly. Now I need to know what happens next! Definitely pick up Glamour in Glass, David. I think you’ll enjoy it. All of the action and adventure is what made the book that much more enjoyable to me. It has been such a long time since I read any of Jane Austen’s books, and I haven’t seen any of the movies so I have no clue which character should be which. That’s probably why Shades of Milk and Honey took me a bit to get into until the action kicked in. The Bubbles…Oh the bubbles. Haha, shallow but very true. The bubbles made me read the back of the book, because I wasn’t crazy about the rest of the cover. It sounds good! The bubbles distract from the intense stare, don’t they? I love the cover of this one, and the third book’s cover is just breathtaking. I hope you can pick it up soon! No, drat. I’m Canadian, too. Curse the non-US restrictions! First, I wanted to thank Pushy and Heather for the glowing review. Now, I wanted to take a moment to let you folks know that the first edition of Glamour in Glass is sort of a collector’s item because they accidentally omitted the first line. Yes. Really. And I guess that our lucky winner is getting a collector’s item!! I love the cover, and I am intrigued by the fact that it is both historical and fantasy. This book is a perfect blend of the two, very enjoyable! I loved the first book, and can’t wait to see what happens in the rest of the series. Thanks for hosting this fun giveaway! The magic of glamour is cool – to be able to create any illusion you want! I love historical fiction and when you add the magic it’s even better! This story sounds great and I would love to win this book! I can’t really say what intrigues me most because I didn’t read anything that you wrote because I was worried about spoilers! However, the first book sounds very interesting and I wouldn’t have given it a second glance if I hadn’t seen it on your site. I love Jane Austen but am not really a historical fiction person, yet this series sounds really good. Thanks for the review! Our review wasn’t that spoilerific–it just told you who Jane wound up with at the end of Shades of Milk and Honey, though. Definitely check this series out. I loved them and I’m not usually a historical fiction person either. The time period sounds interesting. This book covers the time when Napoleon was trying to conquer Europe, and it was definitely a very interesting period of history. The cover is what intrigues me most. That and how much you were raving about it! This one looks so great! I really need to pick myself up a copy!